And for us, that was Megan Garrelts — the co-owner and pastry chef behind Rye and Bluestem (alongside her husband Colby Garrelts). The Garrelts recently opened their second location for Rye (4646 JC Nichols Parkway) on the Country Club Plaza in the former Morton’s Grille space. The new spot is open with warm wood, Art Deco fixtures and an upscale take on Midwestern fare. 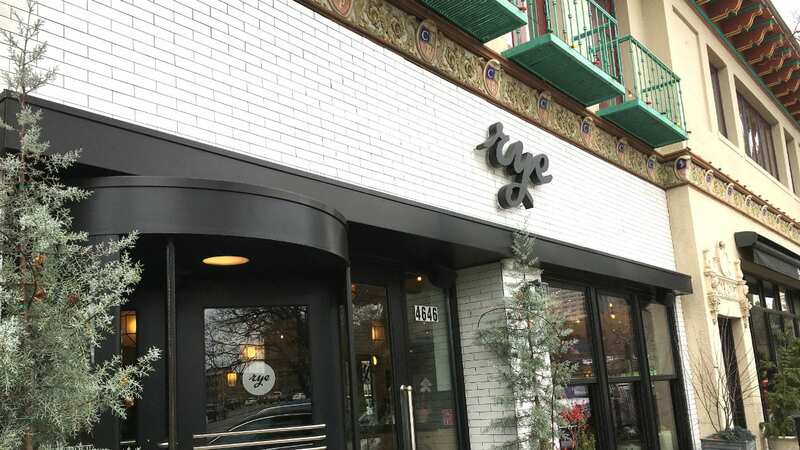 The open kitchen at Rye Plaza kicks out buttermilk fried chicken, steaks, pork chops and chicken and dumplings. 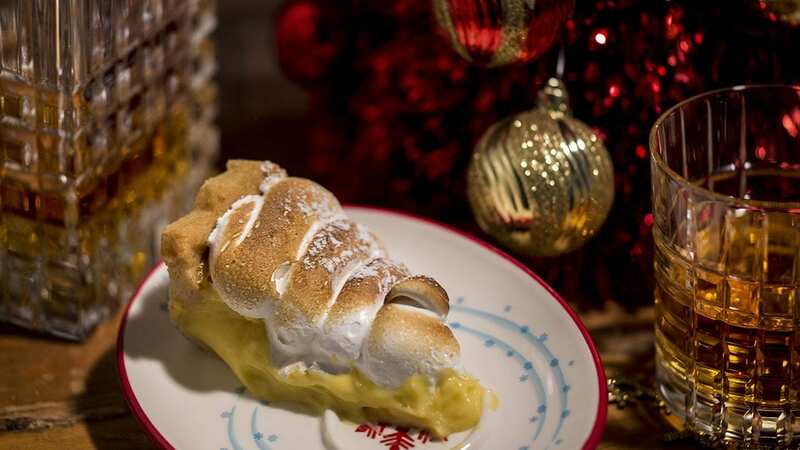 The pastry kitchen, a separate space framed by white subway tiles, features a range of traditional pies — lemon meringue, banana cream, dutch apple — alongside Kentucky bourbon cake and a cheese plate. In honor of the holiday season, Megan Garrelts shared her recipe for lemon meringue pie with Flatland. And as she writes below, it’s a chance to bring a little sunshine to the winter months. Garrelts: The lemon meringue pie is not for everyone, but if you like a super rich, tart, puckery filling, then this is the recipe for you. The meringue topping is sweet and creamy, following my tried-and-true rule of thumb: Use a 2-to-1 sugar-to-egg whites ratio, and you will have a fantastic, glossy meringue. And if you get enough torch on the meringue you will add a little of that wonderful campfire-toasted flavor. I particularly enjoy this pie in the winter, when it adds a bright flavor to a normally dreary time of year. You can also substitute Meyer lemons during the late winter months when they are in season. Meyer lemons will add a floral scent to this pie and make for a slightly less harsh lemon flavor. The first portion of this recipe teaches you to make a pie crust from scratch, while the second part relies on that scratch crust as the base for the pie you’re going to bake. This pie is likely a weekend adventure. It’s worth chilling the dough overnight, and you’ll need time for the crust to cool after it’s been baked. But with a little planning, you can have a pie that is a slice of Midwestern comfort. Garrelts on the pie crust: It scares some, but it was my favorite pastry to master. In my early days in the bakeshop, I always had so much fun mixing, kneading and rolling out the dough, even if the crust did not turn out right. This recipe was developed over time and many attempts to find the right balance between good butter flavor and the delicate texture that lard creates, plus the perfect mix of sugar and salt. With very few ingredients in a crust, it’s important to use the highest quality ingredients possible. I recommend using good-quality butter high in butterfat, such as Plugra, to ensure that the crust will form properly, and a delicate salt like kosher or sea salt. Remember: Making pie is not easy, and there is no bakeshop secret to becoming a great pie maker. Patience and practice are the key. Combine the flour, sugar and salt in the bowl of a food processor and set in the freezer for 30 minutes; you want all the components to be very cold in order to get the flakiest crust possible. Place the cubed butter and lard on a baking sheet and set in the freezer to chill hard. Return the bowl with the dry ingredients to the food processor. Add the cold butter and lard to the dry ingredients in two additions, pulsing to combine after each addition. Slowly add the ice water to the mixture, pulsing to combine until a dough forms. As soon as the dough holds together in the food processor, quickly transfer the dough to a cold work table. Knead the dough just until smooth, working the fat into streaks and being careful not to over-work the pie dough. Divide the dough in half and flatten each piece into a disc. Wrap the discs in plastic wrap and chill for at least two hours or preferably overnight. To form the crust, dust a work surface and the rolling pin with flour. Place one dough disc on the floured work surface and press the dough down in the center with the palm of your hand to flatten slightly. Then pound the dough flat with the rolling pin. Roll the dough in one full pass, then rotate the dough a few inches and roll again. Continue rotating the dough and rolling, dusting slightly with flour only if needed, until the dough is large enough to fit the pie dish and is about 1/8-inch thick. Gently cut the dough to the desired pan size using a pot lid or bowl as a guide. Gently slide both hands under the dough and hold the dough with the bottom side of your hands and forearms. Quickly slide the dough into the pie pan and gently press the dough into the pan. Crimp the pie dough around the edge and set in the freezer until needed, at least 30 minutes. The pie crusts can be kept frozen in the pie pans, each double-wrapped in plastic, for up to one month. To blind bake (bake the crust before adding the pie filling), preheat the oven to 375°F. Line the frozen shell with a coffee filter and fill the liner with pie weights or uncooked pinto beans. Press the beans lightly into the shell to ensure that the edges are weighed down. Bake for 20 minutes, rotating 180 degrees halfway through the cooking time, until the outer edge of the crimp looks dry and golden brown. Remove the shell from the oven and carefully remove the coffee liner and beans. If the liner sticks to the shell, return the shell to the oven to dry out for about three minutes and then try to remove the liner. Decrease the oven temperature to 350°F. Brush the crimped edge and the bottom of the shell with egg wash and then prick the bottom of the shell. Return the shell to the oven and continue to bake until golden brown, eight to 10 minutes longer. Set the baked shell aside until needed for final pie preparation. Fill a medium saucepot 2/3 of the way with water. In a large nonreactive bowl (see note) whisk the lemon zest, lemon juice, eggs, egg yolks and 1 cup of the sugar to combine. Place the bowl over the saucepot to create a double boiler (do not let the bottom of the bowl touch the water). Heat the pot over medium heat and whisk the contents of the bowl constantly until the mixture thickens to a pudding consistency, about 12 minutes. Once the mixture is thick, remove the bowl from the heat and quickly strain the lemon curd through a fine mesh sieve to remove any cooked egg particles. While the lemon curd is still hot, whisk in the soft butter and salt. Spread the prepared filling into the pre-baked pie shell and bake just until the filling is set, 15 to 20 minutes. Remove the pie from the oven and let cool to room temperature. Meanwhile, to make the meringue combine the egg whites and the remaining 1 cup sugar in the clean bowl of an electric mixer. Place the bowl over the saucepan on the stove to make another double boiler (do not let the bottom of the bowl touch the water). With the saucepan over medium heat, whisk the egg whites and sugar in the bowl just until the sugar granules have dissolved, eight to 10 minutes, being careful not to cook the egg whites around the edges. Remove the mixing bowl from the heat and return the bowl to the mixer. Using the whip attachment, whip the egg whites and sugar on high speed until a light, fluffy meringue forms (medium peaks). Set aside for use on the baked pie, up to one hour. When the pie has cooled to room temperature, use a piping bag fitted with a plain wide tip to pipe the whipped meringue in dollops onto the filling, starting in the center of the pie and working outward in circles until the entire top of the pie is covered with meringue. With a hand-held kitchen torch, lightly toast the top of the meringue. Alternatively, brown the meringue in the oven under the broiler, 1 minute or less. Chill the pie uncovered until ready to serve, but be sure to serve the pie the same day. Any leftovers can be refrigerated uncovered. Note: Certain recipes call for nonreactive bowls (or other cookware) because many foods, especially salty or acidic ones, react with untreated surfaces such as copper and aluminum. When the foods react, the metals dissolve, and the foods pick up a metallic taste, according to Harold McGee, author of “On Food and Cooking: The Science and Lore of the Kitchen.” Stainless steel, glass or ceramic bowls are best. Is Pie the Sweet Dessert Spirit Animal of Kansas City? Did You Know KCPT Published Your Recipes in 1998?